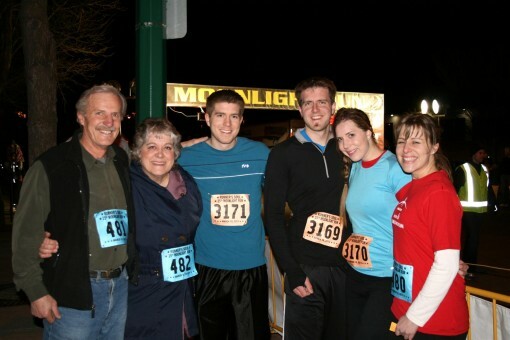 Moonlight 10K Run Recap was posted on March 13th, 2012 and is filed under Fitness, Running. This entry has 7 comments. You can follow any responses through the RSS 2.0 Comment Feed. I didn’t train…at all. I forgot about the race and had not run for 6 months (not even a mile)! Normally, I’m very careful about pre-race meals. It’s usually ½ banana with a piece of whole wheat toast. This time I was weak and shaky from working out hard with volleyball, I just ran into the nearest gas station and grabbed what they had. I’m still not sure what I was thinking. This isn’t stuff I eat. Desperate times call for desperate measures. I guess? …Not really. It was really stupid. The adrenaline rush of the crowd was awesome. My brothers and I stood in line near the front. They had every right to be there. I was just being cute. I expected my time to be like 1:10 considering my injured leg, a mountain-like hill, and not training. I have such high expectations of myself (sarcastic). To be honest, I didn’t really care about my time. I just wanted to experience the race and still be alive afterwards. I can see how running this Moonlight Run would be a blast if one was feeling awake and uninjured. Some people wore headlamps, glow jewelry, or carried flashlights. It felt sort of magical…until that point in the race where I realized I was like…alone…and there was no one with lights. For a moonlight run, there should’ve at least been a moon light to light the way. I couldn’t find it and felt defrauded…so I just kept straight and made sure I felt concrete under my feet. Seriously, it was really weird and dark and alone and strangely fun. However, it also meant I was at the back of the pack. During a race, I have never experienced that feeling where you literally just want to curl up in the grass by the road and go to sleep…it was so odd. It wasn’t like…”Oh, my legs are soooo tired”…it was like, “I just want a nap, more than anything”. After a bad night’s sleep and several hours of battling it out on the courts, I guess that’s legit. My left quad started acting up (i.e. getting a lot worse) and my legs started to buckle. It was actually kind of funny, or rather…I looked funny. Lesson to take home in run-on sentence format: Don’t run races without training on the day you’re already doing something really active on a bad night’s rest when you’re really tired and have an injury while running with cramps all because you ate a stupid McChicken burger. Clearly, it’s all the burger’s fault. I don’t think my brothers were really ready for this picture, but when you’re that handsome it doesn’t really matter. My time was 1:14. Isn’t that cute? I should be burying my head in shame, but whatever. I did it. As soon as I sprinted to the finish line, my left quad was done and my leg could barely support my weight. I limped all over the place. So embarrassing. I kept praying I wouldn’t see anyone who knew me. However, I’m extremely proud of my family. My parents and sister did the 6k (furthest distance for them! Yay!) and two of my brothers killed it in the 10k. In the whole group, only one of us actually trained for the race (what a brilliant idea!). That’s my family for you. We think we can do anything, whether or not we practice. Of course, we could do a lot better if we did. (grin) All the same, I’m proud to be in a family that doesn’t see a challenge as a challenge. Now I can’t wait to do it next year and actually like…run beforehand. …And without pre-race burgers, bleeding toes, and volleyball tournaments. Are you a “fly-by-the-seat-of-your-pants” person? Or are you a meticulous planner? You’re ridicoulous. :) But I guess that’s one reason I admire you so much! Congrats on the run. Well look on the bright side… You completed it! Injury, unconventional fueling :), and no training, but you still crossed that finish line! Congrats! Congratulations! Also, did your dad run in jeans and a button-down shirt? Gina~ YES! That’s my Dad! Haha, he’s not into conventional fitness gear, shall we say!